Every year, I try to bake at least one Halloween-themed treat for my kids. In my house, we love the cookie spiders, cookie ghosts, and dirt cake with gummy worms, though let’s be honest—my children love anything sweet. 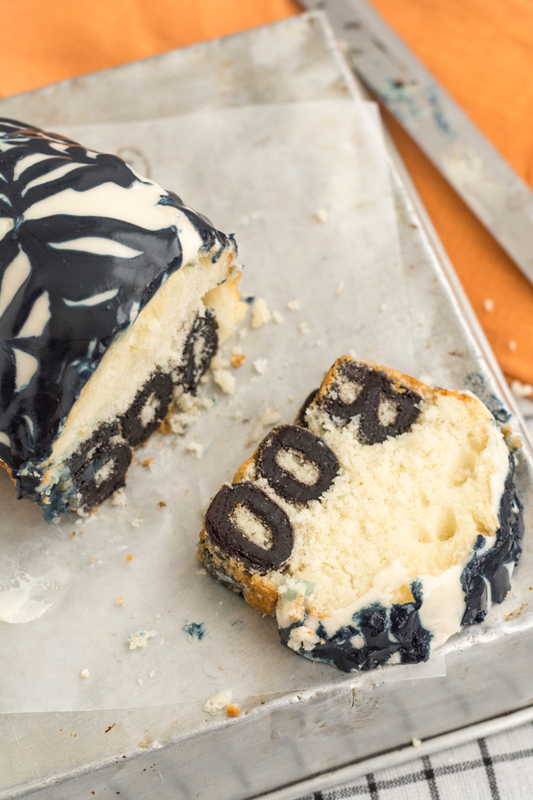 This year, we were inspired to make a Halloween cake with a secret message. 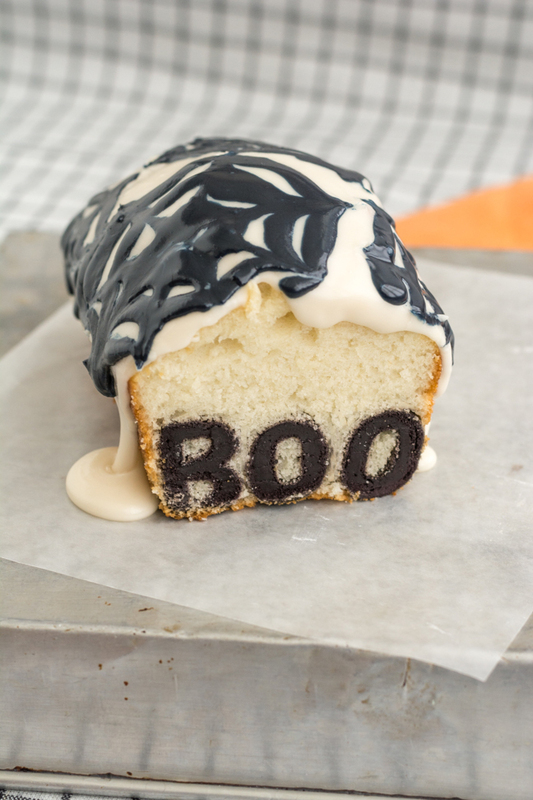 It’s a cinch to make this boo cake, and your kids will love the surprise message when cutting into this cake. 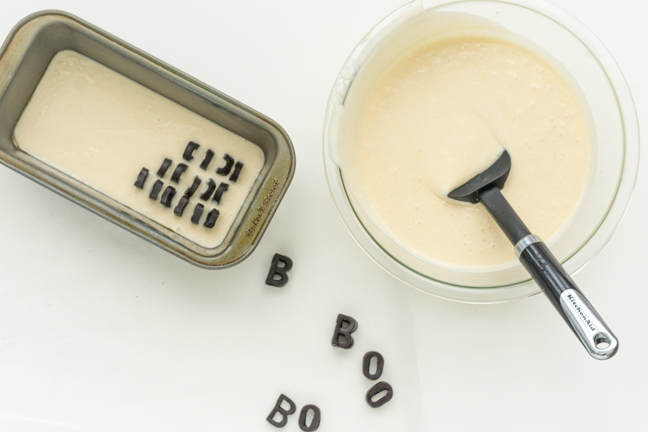 We chose ‘BOO’ for Halloween but the possibilities for this secret message cake are endless; choose your child’s name or initials for their birthday, or celebrate other holidays with short, secret messages baked right in. Step 1: The edible dough must be softened before use. Do this by taking small sections of the dough and kneading it between your fingers until it has softened. Continue until all the dough is soft. 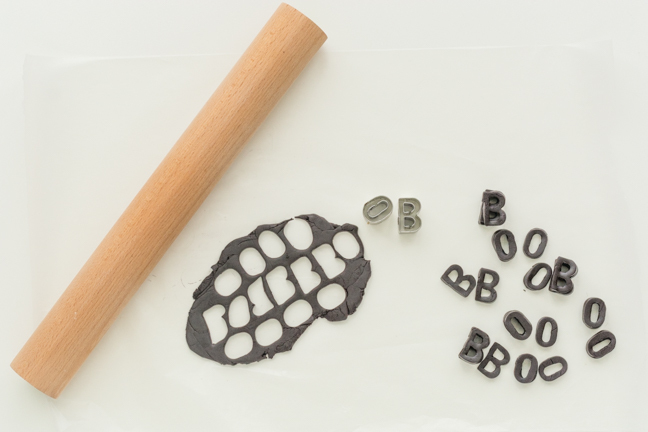 Step 2: Roll out the softened dough to between ⅛” and ¼” thickness and cut out letters. Step 3: Once all the letters have been cut out, add enough batter to the bottom of the loaf pan just to cover the bottom. 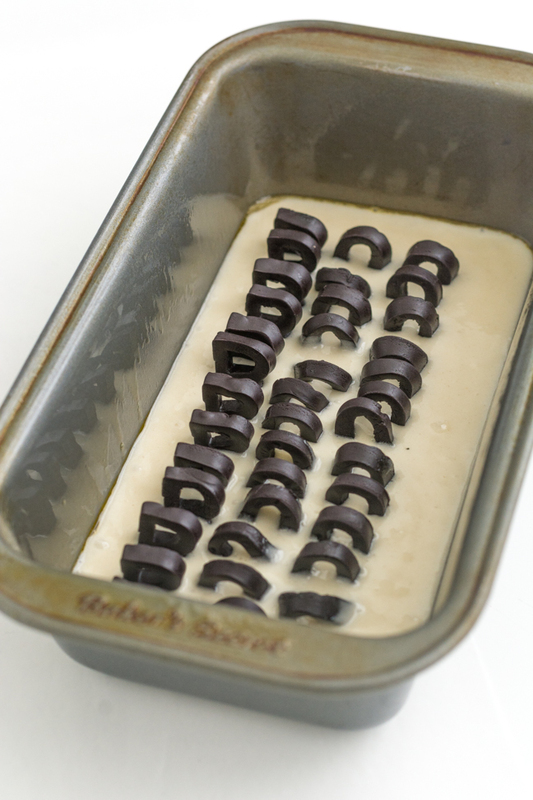 Step 5: Gently spoon batter on top of the letters until they are covered, and fill the pan until it is ⅔ full. 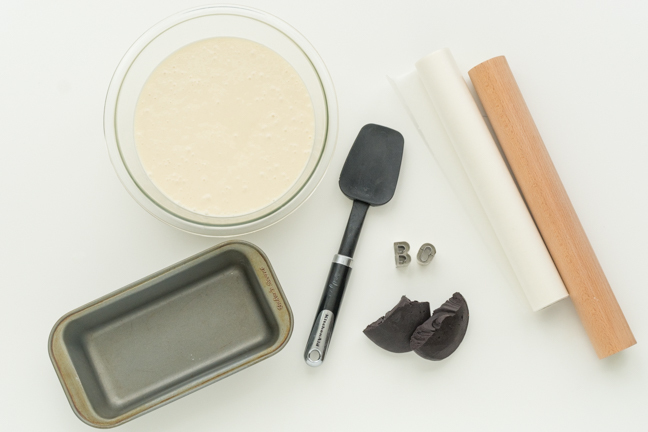 Use any leftover batter in the small loaf pan, repeating steps 3 through 5, to bake the rest of the batter up (why waste it?). Step 6: Bake the 9×5 loaf pan at 350 F for 40 to 45 minutes, until a toothpick inserted in the cake comes out clean. 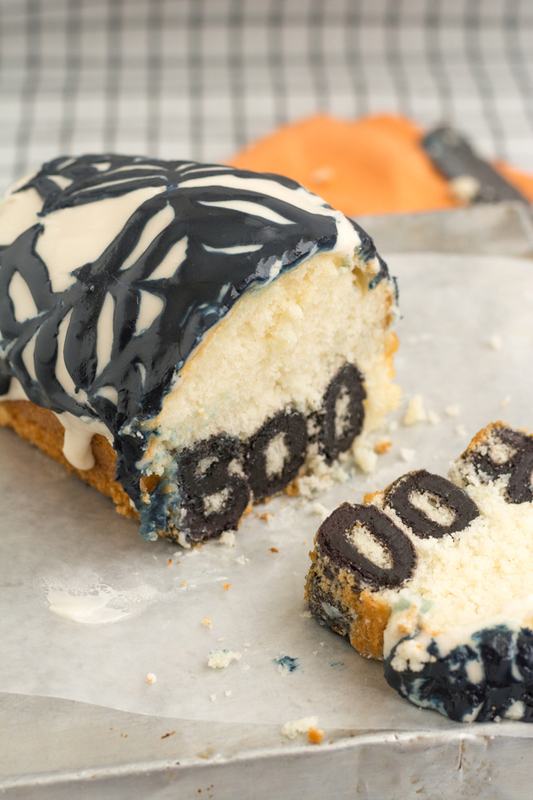 For the small loaf ban, bake at 350 F for approximately 15 minutes, until a toothpick inserted in the cake comes out clean as well. Step 7: Allow the cakes to cool. Frost as desired and slice using a sharp knife. And Boo! to you. Happy Halloween. Amy Christie is the maker behind this heart of mine, a blog about good food, handmade projects and stories of real life. 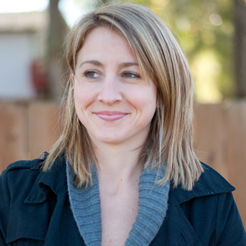 In addition to her own site, Amy is a contributor to the Make It column on Design Mom as well as a content creator for a few other places. Amy lives in the Twin Cities of Minnesota with her project-mess-tolerant husband and two lively and exuberant children. Follow her on Twitter, Facebook, Pinterest, and Instagram.